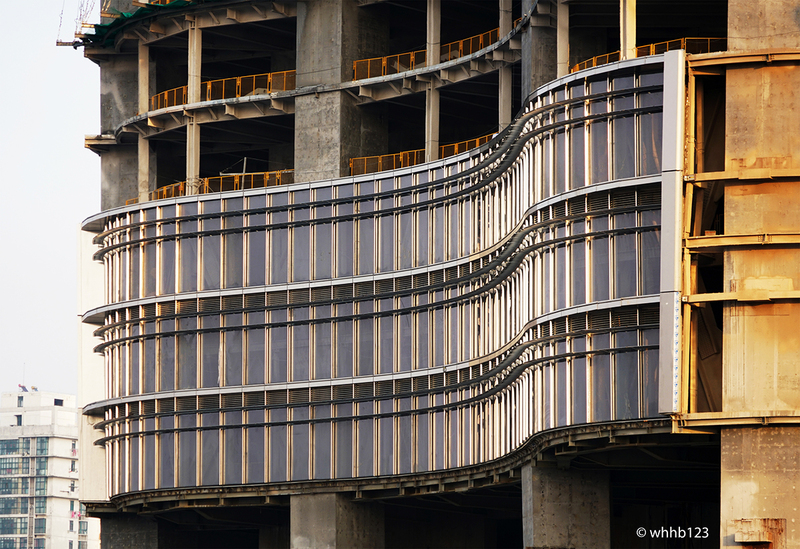 CHICAGO, 30 March 2016 – Wuhan Greenland Center, designed by Adrian Smith + Gordon Gill Architecture (AS+GG), is now under construction in Wuhan, China. The 636 meter tall, 120-story, mixed-use tower will have 300,000 square meters of floor area, including 200,000 square meters of offices, 50,000 square meters of residential space, and a 45,000 square meter Ritz Carlton hotel. When completed, Wuhan Greenland Center will be a true new icon for Wuhan’s skyline and will be the third tallest building in the world. Wuhan, the capital city of Hubei Province in central China, is located on Jianghan Plain which joins the Hanjiang River and the Yangtze River. Divided by the Yangtze, Wuhan is known as the “Three Towns of Wuhan” with Hankou and Hanyang on the west bank, and Wuchang on the east. The three tapered sides of Wuhan Greenland Center represent the three cities and two rivers that intersect to form one unified city. The building’s uniquely streamlined form combines three key formal concepts—a tapered body, softly rounded corners, and a domed top—that reduce wind resistance and vortex action, which builds up around supertall towers. Further assisting in venting wind pressure against the tower, apertures in the curtain wall have been placed at regular intervals. These apertures also house window-washing systems and air intake and exhaust systems on mechanical floors. A variety of sustainable approaches were incorporated into Wuhan Greenland Center that will make it one of the most energy-effective supertall buildings in the world, with an energy savings of 51% compared to a typical office building: a greywater recovery system takes waste water from hotel laundry, sinks, and showers and then reuses it in the building’s evaporative cooling system; a high-efficiency lighting system uses low-energy-consuming ballasts and lamps to reduce required power consumption; and water-conserving low-flow plumbing fixtures will reduce the total amount of potable water required as well as the associated pumping energy. “This architecture represents the combination of formal relationships (the art) of performance and technical aspects ( the science) of performance which we like to refer to as Form Follows Performance. The inlets and dome reduce wind loads and consequently allow the structure to be more efficient and overall, the sustainable systems range from cutting-edge technologies to fairly low-tech solutions,” says AS+GG Partner Gordon Gill. “An Energy-recovery system which captures energy from the building’s exhaust systems and then uses it to pre-heat or pre-cool air entering the building is incorporated into the ventilation design and daylight-responsive controls and sensors automatically turn off electric lights when sufficient daylight is available. Consequently, this is genuinely a purposeful approach to design, both inside and out." Wuhan Greenland Center is a unique blend of the art and a science of Architecture. A purposeful form expressed through a cost effective and functional rationale; an architecture with a strategic performance-based design that is a direct expression of external forces. The tower will be a 21-Century landmark for the city when completed in 2017.